In the summer, your pup wants to frolic and play and roll around in the warm sunshine. There are so many lightposts to sniff, and squirrels to bark at, and tennis balls to chase. After a long cold winter curled-up indoors, your dog is ready to stretch all four legs, wag that tail, and bound into the heat. Though your pup might smile as he chases the frisbee nonstop for a full hour, he might be silently suffering from the heat. There’s more than just dehydration to threaten your beloved companion during the summer months, and though there are a lot of common cooling tips to keep your dog comfortable some of them might not be as safe as you think. Be informed, and avoid making these 6 dangerous mistakes when caring for your dog during the summer months. Ouch! Try walking in your barefoot on your driveway after it’s been baked in the sweltering summer sun. Black asphalt soaks-up the heat and can radiate scorching temperatures even hours after sunset. Sidewalks, too, face the sun all hours of the day, growing hotter and hotter. When you walk your dog down the driveway, or through the parking lot, or along a sidewalk or street, your dog is at risk of burned foot pads. Burned foot pads are excruciating. Sometimes, your dog’s pads may even crack, peel, and bleed leading to painful blisters or ulcerated patches. Don’t force your dog to suffer the burning surfaces of the street and sidewalk. Test the pavement yourself and make sure you wouldn’t mind walking on it barefoot. Try walking your dog mainly in grass, or take your dog on longer walks only at dusk or dawn. If you must walk on any of these hot surfaces, consider dog-booties or pad-protectors. If your pup is suffering from burned paw-pads, be sure to visit your vet: but in the meantime, relive any heat discomfort by applying aloe-vera or other relieving moisturizer. Your pup is hot, why not let him leap into the backyard pool, river, stream, creek, or lake? He loves swimming. Look! You couldn’t get him out of the water if you tried! Different bodies of water pose different threats to your dog. Harmful pests like parasites mosquitoes, bacteria and snakes, lurk in creeks, streams and lakes. You might think the pool is a safe bet because the chlorine keeps bacteria away, but the chlorine itself will irritate your dog’s skin, resulting in constant itching and subsequent wounds and rashes. Even letting your dog romp in the river or ocean during a visit to the beach can be dangerous, as currents and tides are often stronger than your pup. Letting your pup play in the water is a great way to cool-off your dog and provide fun relief from the summer heat–just swim safely! Your pup can still play in the pool, but be sure to wash-out the chlorinated water with the garden hose afterward! If your dog is a weak swimmer, avoid any vast bodies of water or those with a strong current. Try to avoid creeks and streams as they carry the invisible bacterias that can cause serious health concerns. And always provide your pup with fresh water to drink: do not let them drink salt water, pool water, or even puddle water, as they will upset your dog’s stomach and cause harmful health complications. Summer means camping and cookouts and bonfires and barbeques! It is great to have your dog be a part of such lively festivities. Your dog loves these big-people-gatherings: he can table-surf with ease, and he gets to play with so many new friends! 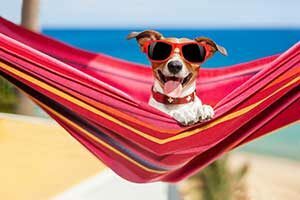 While you don’t want to keep your dog quarantined, you do want to make sure that you have taken safe pup-precautions to have a bow-wow-friendly barbeque. For cookouts, barbeques, bonfires, and camping, you want to make sure all lighter fluid is out of reach of your dog. Just as to humans, lighter fluid is poison to your pooch. You want to be careful with your dog around any open flames, from citronella candles to full campfires, as your dog’s tail can easily catch fire. With campfires, too, you want to keep a special eye on your dog as your using one of their favorite toys for kindling: sticks! 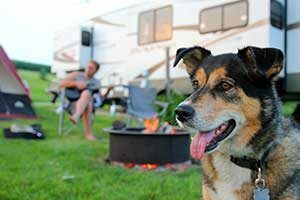 Keep your pup a safe distance away from all fire. If you know you’ll be having a bunch of people over and there will be open flame, consider scheduling a night of dog sitting to avoid any mishaps and give you peace of mind! When it comes to food, you want to avoid giving your dog table scraps. This is something you can also request of any guests when they arrive. A lot of human food might be yummy to us, but it can be harmful (and sometimes deadly!) to your dog. Barbeque sauce, for instance, causes stomach pain for dogs resulting in diarrhea and dehydration. Corn and fruit-pits can be a choking hazard while also irritating your dog’s tummy and causing diarrhea or vomiting. Ice-cream will also cause diarrhea and vomiting. Be sure to keep your dog away from any food with bones, especially chicken bones: the hollow bones of buffalo wings and chicken legs can splinter, piercing your dog’s bowels and harming their intestinal tract–if your dog sneaks any food bones, be sure to call your vet! Ah, summer is full of fresh fruits, veggies, and savory cuisines. You’re eating healthy salads, prepping for parties, and trying-out that new recipe with all in-season ingredients. Of course you want to share everything with your dog, but there are several foods that pet-owners popularly give their dogs that are actually toxic and sometimes deadly. To start, grapes are toxic for your dog. Grapes are popular in the summer, especially if you have small children. These bite sized bursts of refreshing flavor are often dropped and easily snatched by your dog. In the past, it has been popular to freeze grapes for dogs as a fun cooling treat. Grapes can be deadly in large enough quantities, and even in small portions are considered poisonous: play it safe, keep grapes away from your dog. Avocados are wildly popular in the summer months, whether sliced for sandwiches or ground-up as guacamole. Avocados are very deadly for your dog. When it comes to avocados, even a taste is too much. Onions are also toxic, along with raisins, garlic, tea, chocolate, coffee, alcohol, and walnuts: all foods which make a strong summer debut. Be proactive about your dog’s diet and only offer treats that are dog-safe. There’s nothing better than soaking-up the sun with your best friend. Now, you’re outside a lot more, walking on trails and through the neighborhood. You may be tempted to let your dog-off leash: he just wants to stretch and sniff, after all. In the summertime, it is just as important to keep your dog leashed as any other season. All the activity during the summer can be dangerous for your dog. Chasing a squirrel can cause your dog to stray, and get lost. Wandering across another dog can cause a scuffle. And following a sniff into traffic can get your dog killed. Even on your own property, it is important that your dog is properly contained. When your dog takes control, he could seriously injure himself or others. Your dog can get sunburns. Dogs with especially light-colored or white fur are particularly susceptible to sunburn. Dogs with thin coats are also vulnerable to sunburns. Your dog experiences the same pain as you do when it comes to sunburns: his skin will ache, peel, itch, and be easily irritated, causing great discomfort and distress. To avoid sunburns, you’ll want to apply a waterproof sunscreen to your dog. Don’t laugh: we’re serious. Use either a baby-safe sunscreen or a sunscreen specially formulated for dog use. When applying sunscreen, you’ll want to pay particular attention to your dog’s back, nose, jowls, and ears.